AVIA LX 355-20 diode-pumped, solid-state, Q-switched laser offers 20W @ 355nm at a game-changing price point. The AVIA LX closes the gap between the MATRIX series and the AVIA NX series of diode-pumped ns UV lasers for material processing. It shares the genes for best performance in highly demanding industrial applications utilizing a new robust, small, lightweight and extremely price competitive platform. Accepting no compromise in performance the AVIA LX allows the entrance into all kinds of price-sensitive applications. AVIA NX AND LX share the same electrical and control interface. Built on the same design principles that made the Matrix and AVIA series of Q-switched DPSS lasers the most reliable products in the industrial arena, the AVIA LX closes the gap between the low power Matrix and the high power AVIA at a groundbreaking price point. It offers up 20W @ 355nm for demanding industrial applications in rough environments sharing the PureUV active laser cleaning engine with other Coherent UV lasers. The all-in-one-box design of the AVIA LX makes integration and operation very simple. Only a simple 48V power supply and no bulky controller is needed. The laser head has been designed to be compatible with the AVIA NX and other laser brands to minimize the effort for a integration and retrofit. With a weight of below 13 kg also handling is a non-issue. The AVIA LX shares the same control electronics and commands as the all other AVIA lasers allowing the utilization of the identical proven and easy-to-use GUI. The AVIA LX is the low-cost workhorse that you have been looking for. It utilizes proven design principles and innovative packaging approaches to deliver the industry-leading AVIA performance and reliability at an unmatched price point. Integrated Laser Head. With AVIA LX, there is no separate controller needed. Everything from the controller to the pump diodes is now integrated in a very compact laser head. This simplifies integration. And avoiding remote fiber coupled diodes also serves to eliminate possible failure points. Compact Size. Yet the AVIA LX laser head is much smaller than earlier lasers measuring only 13cm x 11cm x 57cm. The beam height is measuring only 50.5 mm enabling the AVIA LX to capture existing installations of competitor lasers. Ruggedized Design. The AVIA LX has been thoroughly HALT tested during the design to ensure that any laser produced will operate reliably in harsh industrial environments. Extended UV lifetime. The lifetime of first generation DPSS lasers with UV or green output was often limited by optical damage to the harmonic crystals that are used to frequency double or triple the laser’s fundamental near-infrared output beam. 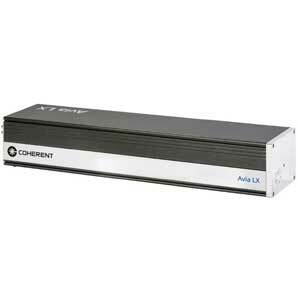 Coherent has manufactured more ultraviolet industrial lasers than anyone else. And we know more about optics failure mechanisms in these lasers. So while some competitors still use an external “pump and filter” approach to try and purge these optics, AVIA LX all use our PureUV™ active laser cleaning engine. This means the laser is truly sealed with an unmatched lifetime. Simple GUI Software.The AVIA control interface is a powerful, yet intuitive PC-based GUI. All control of the laser is conveniently located on virtual buttons and pull down menus/tabs. The control interface also includes RS-232, USB and Ethernet. Three-point kinematic mounting. The new standard mounting interface on AVIA lasers is three-point kinematic mount, which is dramatically superior to traditional flat plate mounting schemes. The laser is thermally isolated from the rest of the laser tool, thus ensuring stable operation within a broad thermal cycle range (15°C to 40°C) inside a laser tool. Additionally, warm up time is minimized in the AVIA LX due to this thermal isolation (<5 min from standby; <20 min from cold start). Lastly, laser placement repeatability is maximized with the three-point mount. This means minimal downstream beam train alignment is required when swapping lasers. Long-lived and replaceable exterior window. In harsh manufacturing settings, material may build up on the window during normal operation. The Brewster Window approach enables the LX to use an uncoated output window which can easily be cleaned. As safety precaution there are two windows build into the system. The customer can change the outer one if contamination cannot be cleaned anymore without breaching the sealed laser head.